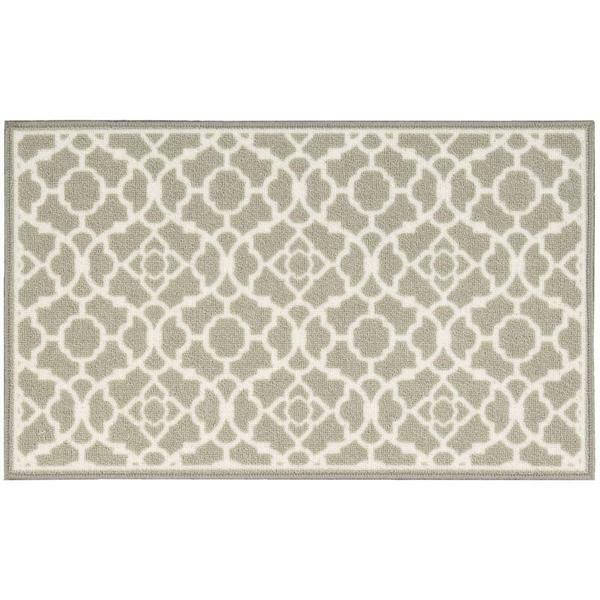 This rug is very thin but has a rubber backing that keeps from sliding on the hardwoods. I’ll be buying another! Color is accurate to the picture. Fancy and Free by Waverly is a fresh story about texture and color, creating a new twist on a accent rugs. If ordered before 2:30pm EST, order will be shipped that same day. Cute rug and is the perfect size for in front of washer & dryer. No slip backing holds the rug securely in place on my tile floor. Color is as pictured. Good quality, the color is neutral greige. I like to change these out every season so they don't get worn out very quickly. They serve their purpose of collecting dirt from feet to keep the indoors cleaner. It's exactly what I needed: an easy to clean and classic looking entry rug. I haven't washed it yet but it's low piling so easy to vacuum (necessary with two big dogs). I bought this rug as a scatter rug for my bedroom but it is more like a bath mat. I returned but the customer service rep that helped with the return was fantastic. "Is this light grey ? Or tan ? " "How much does this rug shed? I would like to place it under an upright piano to dampen the noise to the floor and don't want it shedding." Would think any shedding would stop after 1-3 vacuuming. Ottomanson Nature Cotton Kilim Collection Trellis Design Runner Rug (20" X 59") - 1'8" x 4'11"